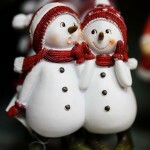 The holiday season is here, and it can be a wonderful time for newlywed couples. 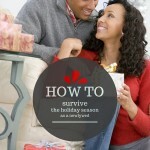 However, if you are like my husband and I, you may need to make sure you are on the same page for the holidays. Sit down and discuss how and where you will spend Thanksgiving, Hanukkah, Christmas, New Years and any other special days of the season. Make sure to have this discussion early so that you are not caught by one family or the other without a plan. Nothing is worse than having to go back on your word. Make sure that you compromise; both of you have traditions, but neither of you is going to get to keep all of them. The two of you will come up with what works best for you and your families. 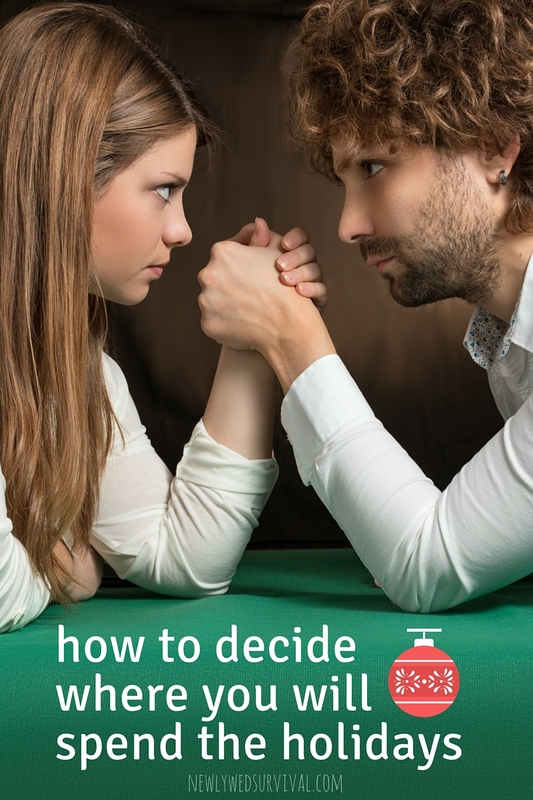 To help you with ideas, here is what has worked for some other couples…maybe one of them will work for you? I don’t blame you Emily! Traveling during the holidays can be very stressful, which is exactly how you don’t want to feel at this time of year. How do you and your spouse spend the holidays? Was it difficult coming to an agreement? Feel free to share in the comments below. This post was first published on 11.16.2012 and updated on 11.20.2015. After lots of years trying to keep everyone happy, we just enjoy staying home for holidays now. Some years, our family comes to visit us but no more long travel trips on the holidays for us! We visit either before or after! You are right, Liz. It is tough keeping everyone happy. 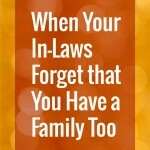 I think as newlyweds we tend to feel like our families are pressuring us to do things. I was actually pleasantly surprised when my mother came out and told me that she knew how difficult it was to work out the holidays, and that we shouldn't worry about what they think. Although she won't be happy if she doesn't see us for every holiday, she understands that she has to share me with another family now. We've been together for 6 years, but last year was the first one we lived together, and therefore, decided to spend holidays together. We currently live in Milwaukee (near his family), while my family is from Minneapolis (5-ish hour car ride). We decided last year we will do the every other--Thanksgiving with one family, Christmas with the other--and continue until further notice. Nice plan, Heather! I wish my husband and I could do an every other year for Christmas. We do both families (one Christmas Eve and the other Christmas day) and they live 2 hours apart...not so much fun traveling during the holidays. When we discussed it, my husband said...but what if someone has a baby one year...we don't see the new baby? It is hard to argue with that! Good advice. At the end of the day, you gotta do what is right for you and your husband. 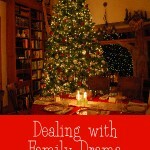 Family pressure can ruin the holidays with drama. My hubby and I always put up some pretty strong boundaries at this time of year. We want to make sure that we enjoy the actual holiday and not spending majority of the time in our car with the kids. Great tips! Spreading out the celebration is easier for me and my family. We spend Christmas with one set of relatives and New Year with another. On the following year we switch it up! This was ALWAYS a big deal... but guess who won. LOL I know, I'm shameless.